The Nest Learning Thermostat has taken the gadget, thermostat, design, and so-called ‘green’ markets by storm, picking up awards from the Consumer Electronics Show and Good Housekeeping since it’s October 2011 launch. In my own recent installation, I was impressed with the ability for it to blend with any color of wall (actually making the house look nicer) and the drop-dead easy use of adjusting the temperature by simply turning the outside ring left or right. Apparently, however, my nightmare installation and setup experience has not been shared by thousands of others, and unfortunately showed several holes in Nest’s product, installation and support only to me – which did not help the $249 hole left in my wallet from buying the product. to come – and frankly is the shot heard around the world ushering in the age of ‘learning’ devices. Designed by two of Apple’s most accomplished alumni, Tony Fadell and Matt Rogers of iPod and iPhone fame, the little round thermostat has revitalized an industry that has grown dormant, boring, and was quickly diving to the bottom on price and profit. Though being such a simple device (one of the easter eggs in the legal section of the thermostat rotates from “my best friends call me Harry” to “it’s just a switch”), the thermostat makes looking at the temperature fun and informative. It has never-before-seen indications that show how long it will take the house to reach a certain temperature and a green leaf that shows when your set point is saving energy. My favorite feature though, because I invented it years ago in concept in an impassioned memo to coworkers, is the fact that the thermostat detects when you are away (out of the house), and turns off the heating or cooling to save you energy automatically. 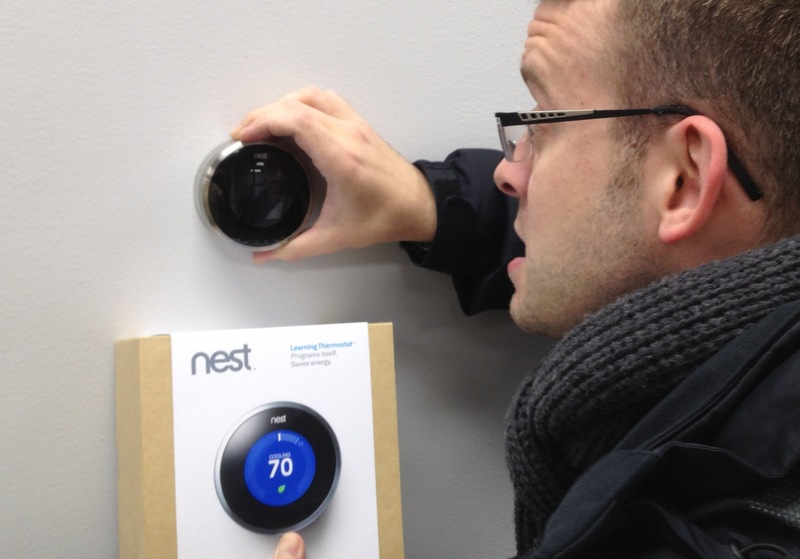 The Nest Learning Thermostat still has plenty of room for growth, however. I had such a hard time to get the product to work, causing my family to sleep in a cold house for a night, that someone in the household said to ‘get that stupid thing out of here’ and ‘give me my old thermostat back – it was at least reliable’. Several issues I found was that Nest is actually incompatible with some home network routers (which was my problem with the wifi in Nest) and my particular HVAC installation wiring was slightly different enough for it not even to turn on. Since Nest Support failed three times to call me back after multiple messages and multiple calls and hours on the phone when I did get ahold of them, I was left in a lurch to fix the problems myself. It all makes sense now why I had so many problems, but it was maddening at the time. But probably the most disappointing thing, that can be fixed by a simple firmware fix or the addition of a missing set point adjustment feature, is that the thermostat randomly reads 2 to 5 degrees hotter than what the old thermostat reads the temperature as, forcing you to warm the house to 73 degrees Fahrenheit in winter at times to be comfortable. This is a great psychological trick to keep your house energy efficient and cold, but I don’t believe it was Nest’s intention to do this. I am looking forward to seeing improvements in the Nest Learning Thermostat over the next few months, specifically their mobile apps which are very focused on temperature adjustment, but have the potential to make energy management very engaging if Nest chooses to go that route. And then there is the question of what Nest Labs will come up with next … which if Support can give feedback to Tony and Matt from the customers calling in according to my sources, it might be something as crazy as revitalizing your lawn sprinkler system. How ‘bout them apples?